We're in love with the monogram trend here at Plaid! The addition of a personalized initial gives a unique touch to any room or decor piece. These types of pieces can be expensive, so we're sharing with you some easy (and budget friendly!) ideas on how to use our FolkArt® Alphabet & Monogram Paper Stencils along to make your own. These also make great housewarming gift ideas for friends or new neighbors - so grab your paint brush, and let's get going! Use either reclaimed pallet wood or a wood surface to make this Monogram Wall Art. The matte chalk finish of FolkArt® Home Decor Chalk looks great with the bold Serif Font stencils. Throw pillows add warmth and color to any room, don't you think? Use a shade of FolkArt® Multi-Surface Satin Acrylic Paint that coordinates with your existing throw pillows to stencil a monogram onto an inexpensive pillow cover! You'll find a selection of watering cans and other metal vases at flea markets and thrift stores - give one an elegant makeover by using the Italic font like we did below. 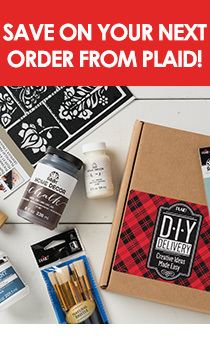 Head over to Plaid Online for more crafty inspiration!